Wishing to preserve the type of horse that had long been selectively bred in the Ozarks, in 1948 a group of interested horse breeders incorporated and secured an organization charter for the purpose of maintaining an accurate stud book. Ten years later, because of increased interest and demand for the Missouri Fox Trotting Horse, the organization reincorporated as a stock company. In 2004, the MFTHBA Board of Directors recognized the need for a registry specifically for Fox Trotting horses between 44 and 56 inches in height. 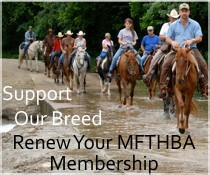 In May of that year, the Missouri Fox Trotting Pony registry was officially launched under the auspices of the MFTHBA. The world headquarters for the MFTHBA is in Ava, Missouri, where the Missouri Fox Trotting Horse Show and Celebration is held every September.